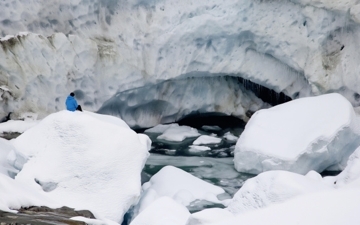 Claude Lorius is a glaciologist. Over a 60-year career he has participated in more than 20 polar expeditions—not only to study glaciers and glacial movement, but also to drill deep down into their near-timeless cores to analyze the ice from different time periods. What they reveal is fascinating, and one of the film’s memorable moments comes when we’re taken into an archive of core-drill ice samples all stacked in rows on shelves according to samples dated by their air bubbles—some of them going back 800,000 years. Lorius began his study of glaciers in 1956 as a 23-year-old man, but as early as 1965 his research was telling him something disturbing. Long before the polar caps began to melt, Lorius was predicting that they would because of the appearance of so-called greenhouse gasses in the ice samples he was taking, and the way those gasses altered the composition of the ice. There’s no denying that the work Lorius does is fascinating science, unless you’re a U.S. politician who denounces anything that gets in the way of the economy. But it’s not very compelling as drama. 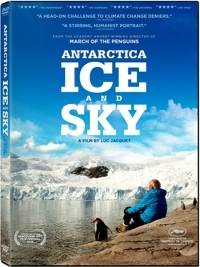 Antarctica: Ice and Sky, a film by Luc Jacquet that closed the 2015 Cannes Film Festival, is a treatise on global warming that’s frankly dull in spots. The dialogue is overwritten and often stilted, and there aren’t enough shots of Antarctica in HD—with far too much of the film relying on grainier archival footage from earlier expeditions. What Lorius and others do may be fascinating as scientific research, but so much of that research is repetitive and the progress so glacial itself that there isn’t anything close to a dramatic structure to be found here.